Learning to program in assembly language is an excellent hands-on introduction to computer architecture. However, assembly language has a bad reputation of being difficult to learn. Through the use of complete program examples, flow diagrams, and color codes, Assembly Language Coding in Color helps... read more students and computer enthusiasts start on a solid path to understanding computer architecture. 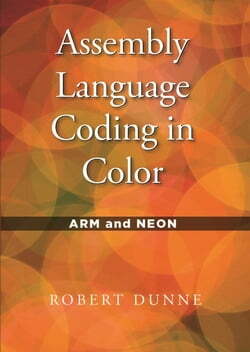 Over fifty color illustrations are included to explain programming techniques as well as ARM and NEON instructions. Topics like binary and hexadecimal are introduced through programming examples as well as appearing in appendices. Is a book in color worth twice the production print costs of one in black and white? It is for those students struggling to get a working knowledge of a subject where they need to connect concepts to implementation. Learning computer architecture through hands-on assembly language programming experience helps develop well-rounded programmers and computer engineers.